As requested - a study of the large greeblie on the right rear of the belt. 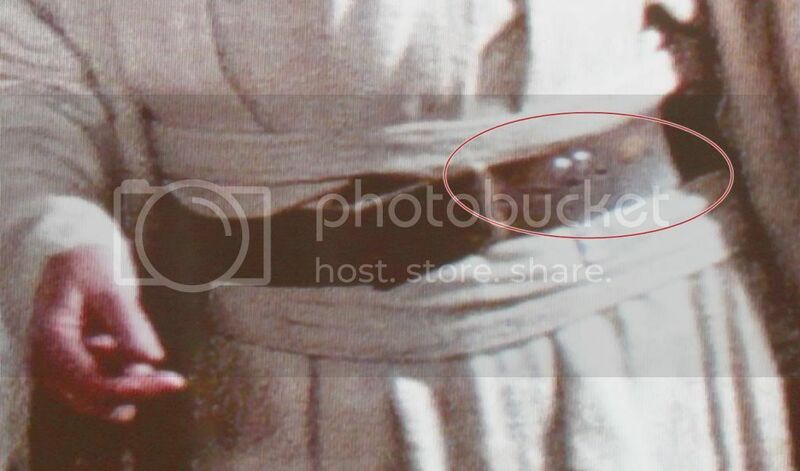 In going through all the screen shots I have taken of the belt I also noticed another detail about the saber hook. I could find no clear pictures of the entire greeblie in one shot. This first pic at least shows the relative length of the greeblie and how close the left edge is to the center of Ben's back. Later shots will show the left and right ends of the greeblie in relation to other belt items. 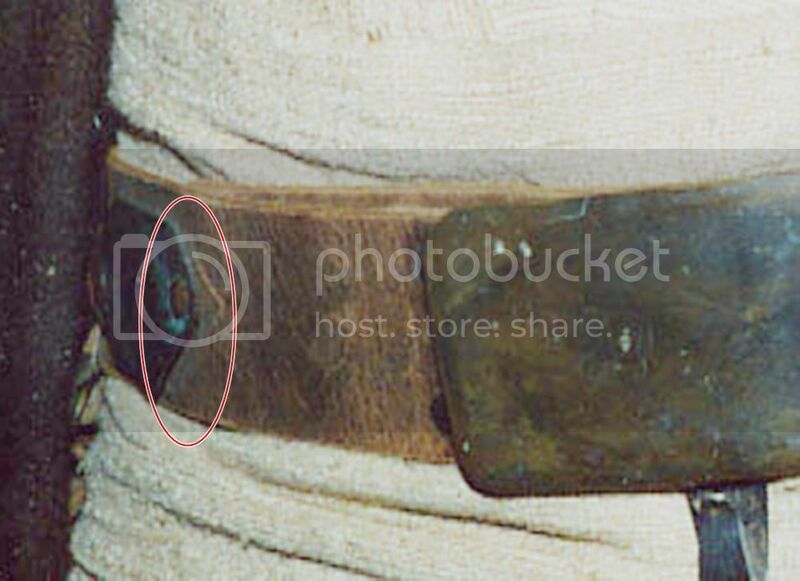 The next shot shows the left end of the greeblie in relation to the "D" ring and the two holes in the belt. This next shot shows two distinct ripples on the left side and the uneven bottom edge of the greeblie. 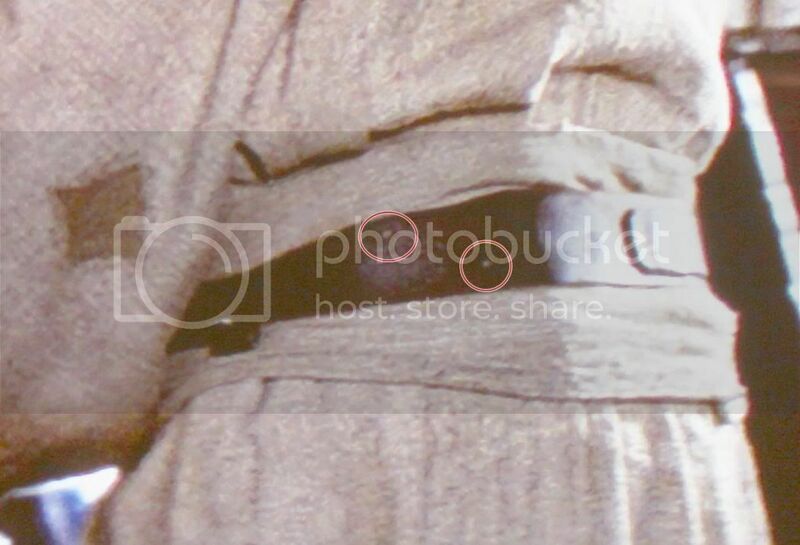 the next one shows that the greeblie is not centered between the top and bottom edge of the belt. It is slightly closer to the bottom edge. The next pic shows how close the stud is to the left end of the greeblie. It also is pretty clear on how the end is cut. It is pretty squared off except for the corners that are trimmed of slightly at a 45 degree angle. The next two pictures show the right end of the greeblie and how close it is to the rear connector to the pouch. The stud is also very close to the right edge of the greeblie. Also, the right side of the greeblie is not warped like the left end. 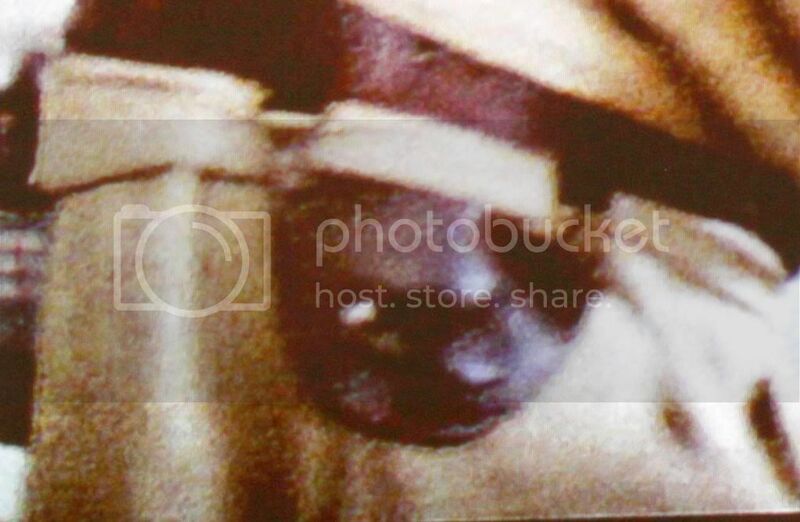 Finally, the following four shots show that the studs for the saber hook appear to be silver and not antique brass. I think that pretty much exhausts this study of the ANH Kenobi belt. Let me know if you have any other items on the belt to explore. Hopefully someone will get the chance to see the entire costume on display somewhere and be able to study all its details. After reading all your wonderful threads on the "Old Ben" Belt, I tried my hand at drawing a schematic of sorts. I started with the assumption of a two inch wide belt. It's my second try. The first had the "banana pouch" too big. This seems better. 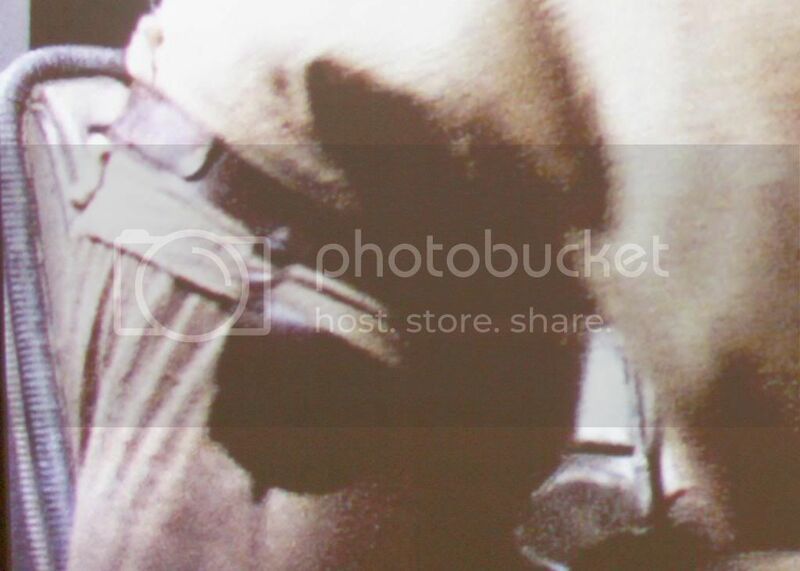 I hope the compression and decompression from photobucket doesn't mess-up the image too much. Enjoy! OMG, that is incredible, Dan! Hi Dan and welcome to the forum. 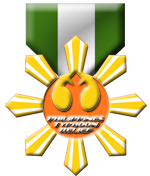 You flatter me by making your first post here on the forum such a great rendition of the research I did on the Ben Kenobi belt. Recently I have been writing up all the details that I want incorporated in the new belt and you have summed them up so well in a picture. The only thing I would change is the greeblie on the pouch. I believe it is more of an oval shape with a flat top and bottom rather than a football shape with pointed ends. 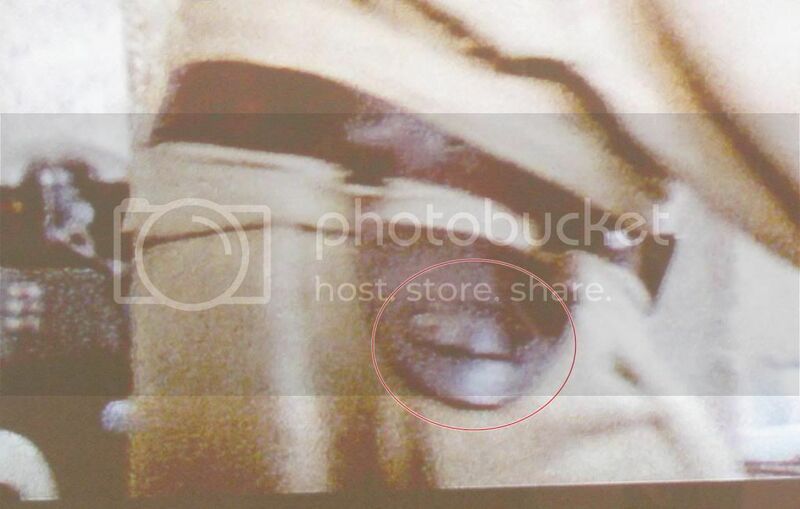 Also - is that stitching on top of the pouch greeblie? You even have the ridge I suspect is on the small greeblie! I'm hoping that Lgtsbr can come up with a good design for a functional pouch and we should be in business. Thanks for the kind words. 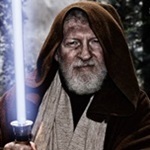 A little about me- I have wanted an Obi Wan lightsaber since I first saw it in '77. I recently began to acquire the stuff to build one. (I'm a little slow, I know.) This is what got me interested in your threads as it would need a belt to hang from, right? 2) The greeblie top shape matches the shape of the bottom of the pouch. Agree? Try cutting the greeblie shape out, flip it over and match it to the bottom. It fits pretty well- weird huh? 3) The bottom edge of the greeblie looks like it had two leather "pendants" that have been cut off. There are two "humps" along the bottom edge of the greeblie and it looks like the "pendants" have been badly cut off. The cuts form a line that slopes from upper left to lower right in a fairly straight line- however, the original edge of the greeblie can be seen rather higher by the rivet on the far side (right side) of the greeblie (near where the other rivet probably is). Admittedly, I substituted a curve for all that so it lacks the humps and the bad cut job. I am willing to redraw what I just said if someone wants all that. I'm guessing that that cut was once related to the little "ear" of leather sticking out of the left side of the "hex" greeblie. Anyway, what do you all think? I just want to make an accurate belt to hang my (some day) lightsaber on. Dan....your attention to detail is spot on! I know some of the ref pics lack some detail, but decontructing a costume (or component) is key in figure out how to make it (whether we have good images or not). Granted, some folks get to see the movie props at various Star Wars exhibits (but...honeslty, I question some of the costumes that are displayed. For example, the Vader displayed at WSMI, when it was in my state, was a stunt Vader...and I swear the Anakin ROTS was a museum replicas...which wasn't a "replica"). 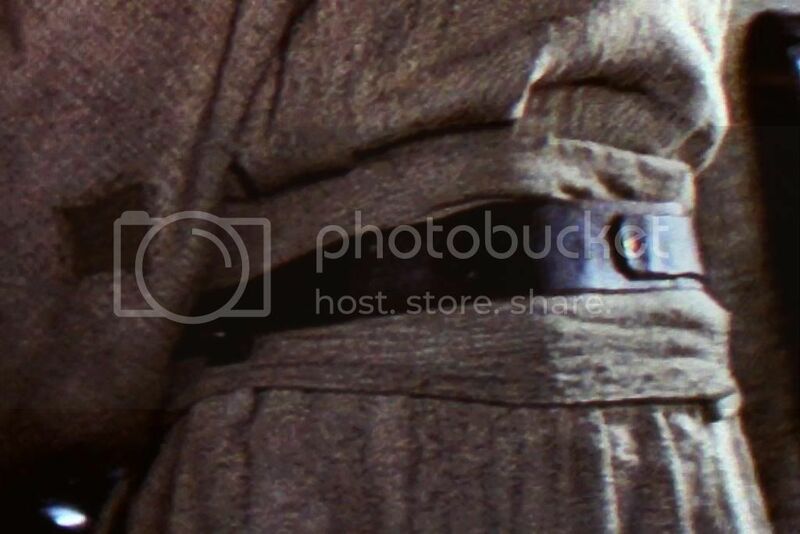 And that last picture you show...tells me the belt connects in the front, which will be a LOT easier to put on than the "classic" Prequel belts (which almost always close in the back). I'll be making one of these Old Ben costmes in the foreseeable future. Sure, I'll do a tutorial, but first let's agree on what's being made. Here are two additional pictures. If you copy and paste to M S Paint and zoom in you'll see it better. Scale is the same- 32 pixels per inch. First picture: Here is what I think the pouch greeblie looks like. Instead of a stylized curve at the bottom, I put what I think I see. The bottom photo is a crop from Ben Kenobi- the top photo I have (badly) highlighted what I think I see, and the top left is my drawing based on my description in my second post above. 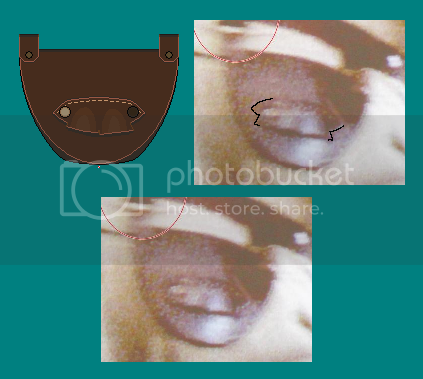 Also, I darkened the rivet on the right so it would look more like what you are seeing in the picture. What do you think? The second picture is my guess on what the little piece of leather looks like under the "hex" greeblie. I also noticed that the corner on the extreme left is square, not rounded as I originally drew it. It appears rounded because it has curled up I think. Also, I left the hole the size of the rivet head so you could copy and paste to see how it fits- obviously, the holes should be the size of the rivet shaft. The bottom belt picture should be used to update my old belt drawing. Dan - one thing I have found in reviewing these screen shots is to be cautious about hanging my hat on one picture. To support my assessment of the structure of the belt and items I have tried to get multiple shots to support what I am "seeing". On my series questioning whether the front greeblie is metal or leather I tried to see if lighting and shadows played a part in what some thought was metal. Having said that here are a couple more shots of the pouch greeblie I took. This first shot appears to show four holes (two pair) in the upper half of the greeblie. It also appears to me to have a fairly smooth edge on the bottom of the greeblie. This second shot also to me shows a fairly smooth lower edge (the lower left portion looks to me to be in a darker shadow due to Ben's shifting body positioon related to the set lighting). 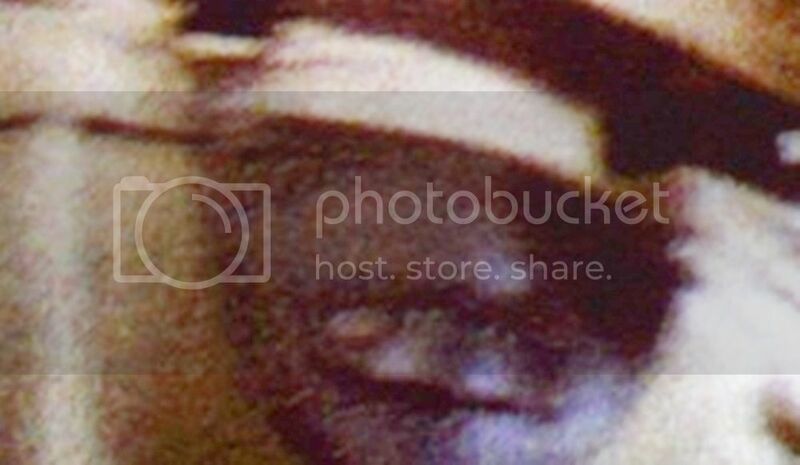 But it also shows apparently a different pair of "holes" in the greeblie on the right side angled from upper right to lower left in what appears to be the middle portion (top to bottom) of the greeblie. This last shot is I believe the same one you showed earlier. It appears to have a whole series of holes or stitches along the upper edge of the greeblie much higher that the "holes" in the first picture above, as well as the irregular edge you are proposing. I think what is showing up in these pictures is the enhancement of the pictures is picking up lighting and shadows in the set area behind and above the camera shooting the scene. The stitches you see and the "holes" I see may be spot lights in a bank above and behind the camera. I hesitate to make a conclusion about the irregular bottom edge and the holes in the greeblie unless I can see other consistent pictures showing the same things in the same positions. One thing I will say is I do agree with the placement of the straps holding the pouch. By that I mean I was thinking that the strap was entirely behind the pouch to allow the flap to freely open. After reviewing my pics and your rendition of the pouch straps I think you are correct in that the straps attach both behind and in front of the pouch. Assuming the front strap is only attached to the front pouch flap - it would still allow free opening of the pouch. I see that supported in several of my screen shots. Regarding the front greeblie - My initial thoughts were what we were seeing were marks on the belt in front and behind the greeblie. 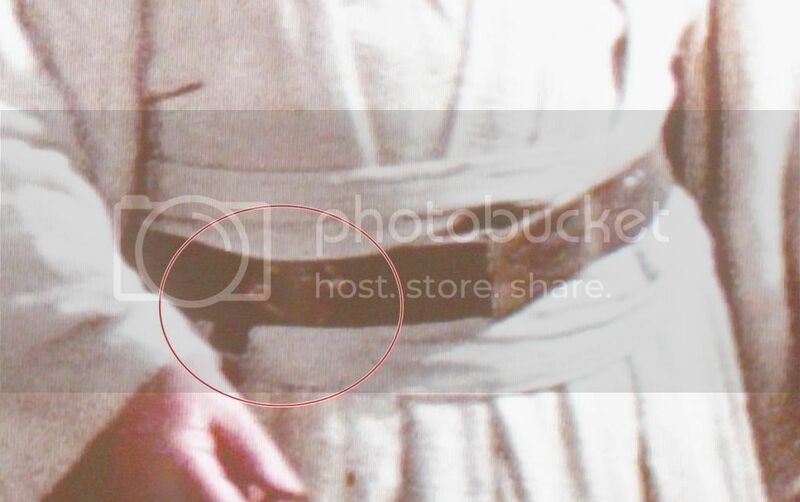 I still believe the front is simply a mark on the belt but I'm not sure about what is appearing behind the greeblie. Your theory about the second layer of leather is interesting. I'm just wondering why they would construct the belt in such a way as to have a partial piece of leather under the greeblie. I understand it would be one way to explain the angular ridge near the front stud. I am of the theory it is simply a warping of somewhat thinner leather of the greeblie with age and flexing of the belt. I am going to try to get some more shots of the area behind the greeblie but it will have to wait until after Nov. 23 due to vacation between now and then. EDIT: By the way, speaking of leather rippling you can see the rippling effect on the large greeblie on the right back portion of the belt in the pictures posted above in the initial part of this belt study. I feel it is also caused by natural aging of the leather and the flexing of the belt rather than something under the greeblie itself. The reason I joined this forum was because of your steady reasoned approach to identifying the details of this prop. I hoped that by joining, we might enter into a discussion and arrive, not at what I thought, or what you thought, but what a few reasonable people, examining the evidence thought. To that end I say: Thanks for the futher input, I'll chew on this for awhile and I await your proposal for how some of the details might look. Have a great vacation! Besides, the only Obi Wan lightsaber parts I have at this time are the Calculator bubbles, the Graflex clamp, and the Browning booster, all repros. Also, while I'm waiting, maybe I'll make some more saber hooks. I follow your logic on this but I respectfully disagree with you on multiple pieces of leather by this small greeblie. Having a total of 3 pieces of leather there would make that section much thicker in my opinion, that greeblie doesn't look much thinner than the main belt itself, so that is why I say it just doesn't look thick enough to be 3 pieces of leather. I'm not sure if we are just seeing shadows or perspective phantoms, I just wish there were more pictures of that back edge to be sure. 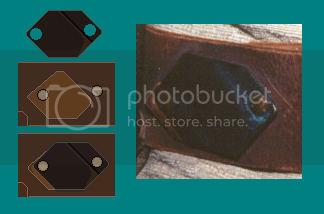 Just from making this belt countless times and now re-designing the whole thing, my opinion is that there is not a second piece of leather under the greeblie but the greeblie is actually covering either a larger hole or a decorative design in the base belt. 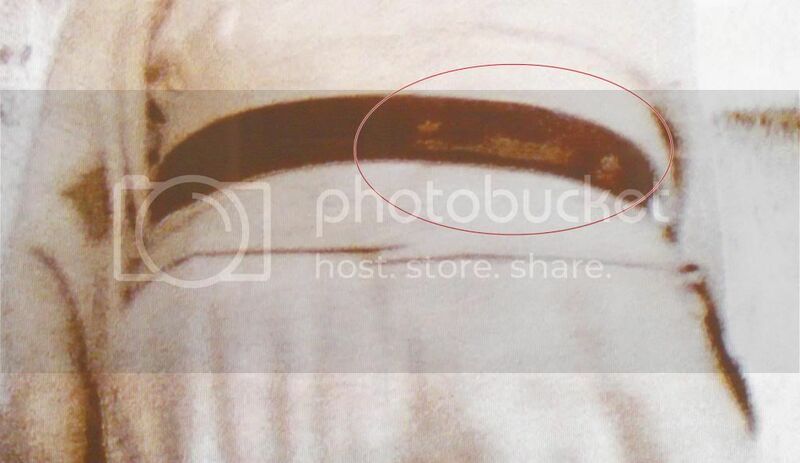 I believe that is why you see the discoloration under the folded up front corner. 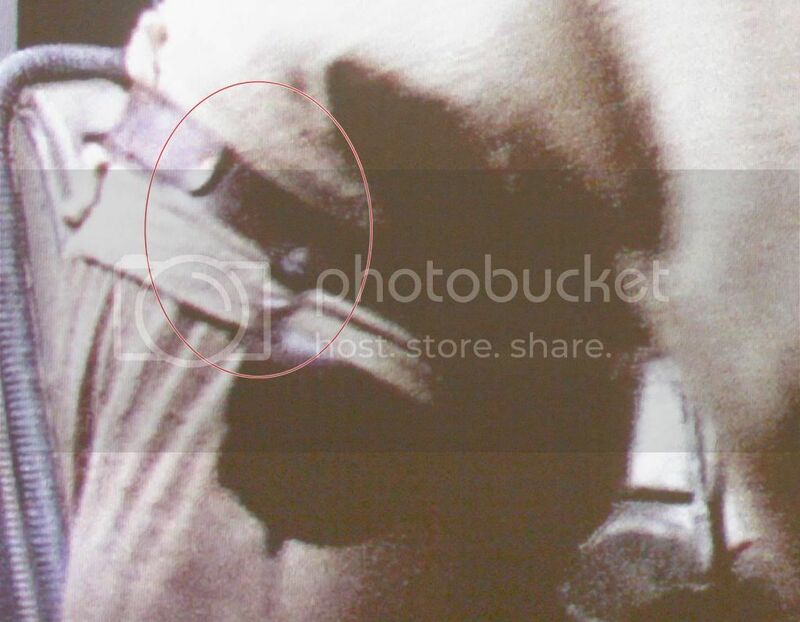 Of course there is another option, the belt was repaired again (poorly if that is the case) after filming and that accounts for some of the different things we see. 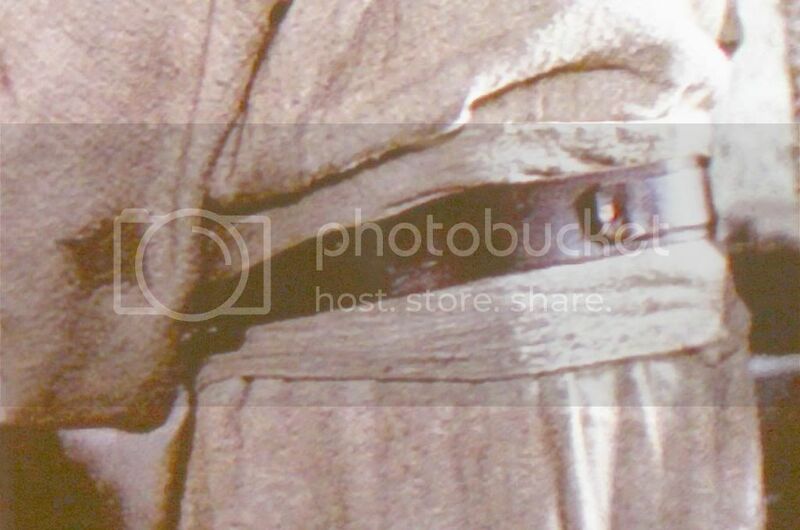 As far as I know, all the base belts used in the OT were re-purposed belts from previous wars and military eras. I know the reason you see the d-rings on the bottom of the belt is because the base belt was turned over and the shoulder belt was removed. I think regarding the "hex" greeblie we might agree on at least a couple things. 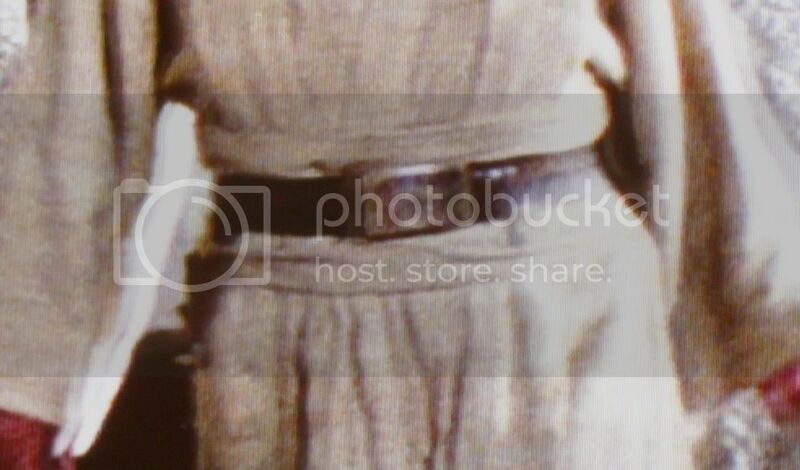 1) There is the base belt, the "hex" greeblie itself, and the little "ear" of leather on the left end, yes? 2) And the little "ear" of leather is a separate piece from the "hex" greeblie, and 3) It seems that must mean that we already have a stack of three pieces of leather on the left end. 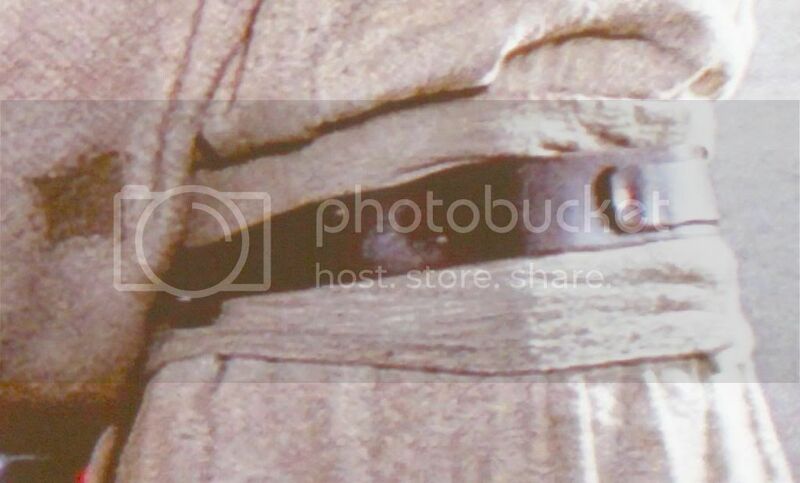 Ben Kenobi mentioned in his most recent post that he felt the "hex" greeblie was "somewhat thinner leather." I am inclined to agree. If that's true (and it might not be) then: It seems that the heavy dark line in the MoM picture is a shadow. My guess was that the shadow was related to the piece of leather already present, which, I suspect, is "somewhat thinner leather" also. It could be that instead of a shadow, it's the discoloration you mention. Now, could it be a wrinkle as BK suggests? Absolutely. There are wrinkles on the back greeblie. 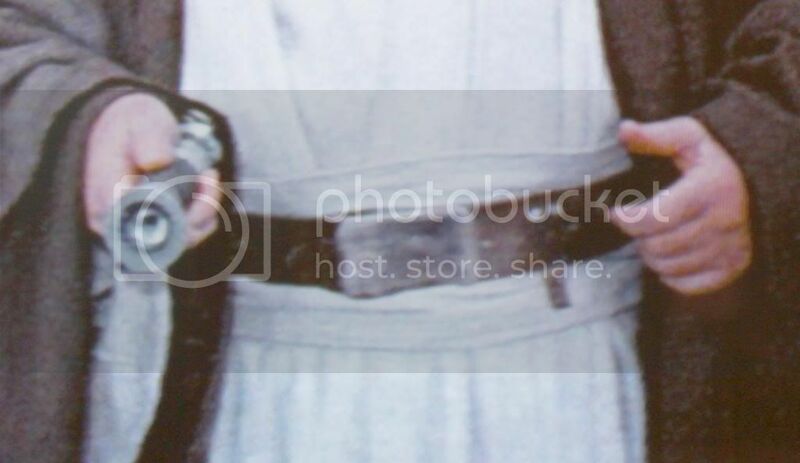 I definitely agree that the belt could very well be a repurposed belt, flipped as you suggest. I'm less clear on your alternative, but I'll try and draw it once I understand. I do love the friendly discussion and debate! There is a good way to check it, we can always test it with a prototype. I'm sure I can get some scrap pieces of thinner leather from Tandy next time I go over and we can try it out. 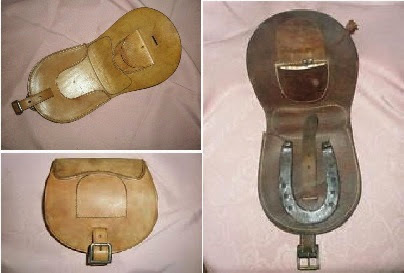 These are Leather Cavalry Military Horse Shoe & Nails Traveling Pouch. This this a very interesting source. The shape of the pouch looks like the old ben's pouch. Moreover, the leather piece on the flap looks like a nail pouch. It lloks as the nail pouch where sewed on the outside of the pouch, on the flap.